Vandana Shiva, Stella McCartney, Rick Ridgeway et al. This is a story about clothing. It’s about the clothes we wear, the people who make them and the impact it’s having on our world. The price of clothing has been decreasing for decades, while the human and environmental costs have grown dramatically. 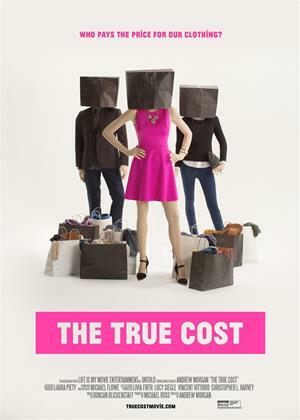 The True Cost is a groundbreaking new documentary film that pulls back the curtain on an unseen part of our world and asks us each to consider, who pays the price for our clothing? Filmed in countries all over the world, from the brightest runways to the darkest slums and featuring interviews with the world’s leading influencers including Stella McCartney, Livia Firth, Vandana Shiva and many more. This unprecedented project invites us all on an eye-opening journey around the world and into the lives of the many people and places behind our clothes. If you keep up with the news, you’re probably well aware of the horrible conditions for sweatshops churning out an endless supply of clothing. If you don’t, well, here is another documentary to catch you up on the latest developments on the subject. The phrasing may make it sound as though this were more of an update than a ground-breaking movie on the subject. It’s honestly more of a college essay than anything the way writer/director Andrew Morgan clearly states his intentions directly into the microphone. While it does seem rather base the way most of this information is spoon fed to the audience, The True Cost does have at least a few nuggets of humanity worth watching on the subject to feel just a little bit more for the plight. First, we get the usual talking heads and news footage mache. The documentary catches us up on all the events and interviews some of the leaders for and of western fashion. We visit the stylish runways and hear from top cloth designers and owners in the business. The term “Fast Fashion” becomes the buzzword of the movie, focusing on how quickly and cheaply clothing companies are able to turn out such a large volume of product. The designers weigh in, the moguls try to reason and the analysts give their two cents. Various aspects are examined from the financial specifics to the bombarding media campaigns of affluenza. All of this is just to give us perspective before we delve into the nitty gritty of the clothing industry. Eventually we venture out past the footage on the nightly news and proceed to the poor countries to take a hard look at the labor of such products. This where the more unseen and important angles of the story take shape. The detrimental effects of farming genetic cotton is displayed for all its horrific cost to human life. The surplus of unwanted clothes transported to lesser countries - after they’ve already been through thrift shops - really makes a statement about overproduction. But, of course, the biggest draw are the appalling conditions of sweatshops. They continue to be dangerous and unsafe businesses where workplace abuse and death occur far more than most any other profession. To bring a human angle to this subject, we follow one struggling mother working in a sweatshop. She does her best to keep a cheery mood as a mother, but can hardly maintain face when talking to the camera about her work. She relays the terrifying conditions and the constant abuse from her bosses. What’s most depressing about her story more than anything is the separation from her child. Many sweatshops workers have to leave them behind with family for many months just to make ends meet with their hours. I can hardly stand being away from my daughter for a day let alone weeks upon weeks. While I appreciate Andrew Morgan trying to bring a human angle to a topic buried in glossy magazine ads and 24-hour news spin, he’s all over the place with his well-meaning and honest movie. It’s a bitter reality that deserves more attention, but perhaps needs to be much more focused. I would love to see an entire film just exploring one or two of these families displaced and devalued by a global industry that has gone too far. Instead, we only get to spend a few minutes and a handful of interviews with each as the movie quickly darts between 13 countries to cover all its bases. The True Cost provides a decent contrast of how the clothing industry affects the world. It will open a few eyes, but leave you desiring something more if you’re already awake on the topic. As an expose, it becomes draining the way it delivers blow after blow on the broken state of fashion. There’s a small glimmer of hope as the movie briefly presents an eco-friendly clothing producer based in America with their own labor working decent hours. It’s a tiny blip in a crowded industry, but at least there is some alternative present to all this doom and gloom.